The oral manifestations of bacterial diseases are varied ranging from nonspecific ulcers to the nearly pathognomonic strawberry tongue of scarlet fever. The bacterial diseases with oral manifestations range from the highly prevalent gingivitis/periodontitis to the much rarer diphtheria, a disease physicians in North America would not expect to encounter. 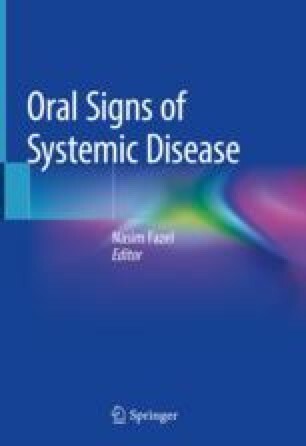 This chapter covers the salient features of the following bacterial diseases with emphasis on their oral manifestations: syphilis, gonorrhea, tuberculosis, acute necrotizing ulcerative gingivitis, scarlet fever, diphtheria, staphylococcal scalded skin, leprosy, gingivitis/periodontitis, granuloma inguinale, tularemia, and cat scratch disease. Drago F, Ciccarese G, Cogorno L, Tomasini CF, Cozzani EC, Riva SF, et al. Primary syphilis of the oropharynx: unusual location of a chancre. Int J STD AIDS. 2014; https://doi.org/10.1177/0956462414551235. Verma S, Prakash R, Mohan S, Singh U, Agarwal N. Primary oral tuberculosis. BMJ Case Rep. 2013; https://doi.org/10.1136/bcr-2013-010276. Senel E, Satilmis O, Acar B. Dermatologic manifestations of tularemia: a study of 151 cases in the mid-Anatolian region of Turkey. Int J Dermatol. 2014; https://doi.org/10.1111/ijd.12431.